(Photo: Ivars Kupcis/WCC)Swiss student, Anouk Walliser Keel, 14, speaks at the World Council of Churches in Geneva on Nov. 21, 2018. Protecting children from any kind of violence has always been and should remain an essential message of Christianity, Ecumenical Patriarch Bartholomew has told a gathering at the World Council of Churches for World Children's Day. 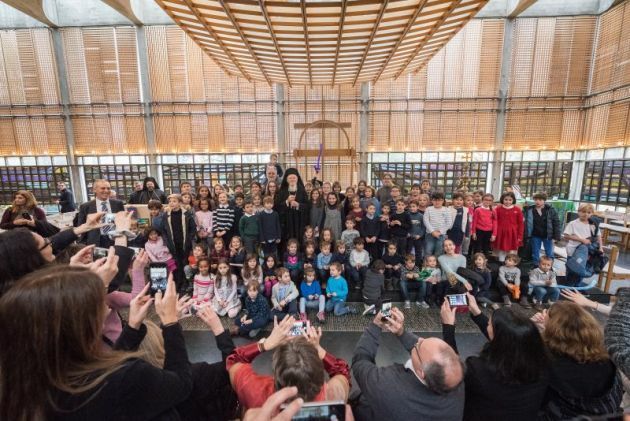 The patriarch was the keynote speaker at an event involving the WCC and the United Nations Children's Fund (UNICEF) on Nov. 21 for World Children's Day at the Ecumenical Centre in Geneva, a gathering in which young people had a key input. "It is important to bear in mind that children do not only represent our future but that they are in fact the present upon which the future is being built," said Patriarch Bartholomew. The Ecumenical Patriarchate of Constantinople said his church was one of the founding members of the WCC. The council's general secretary, Rev. Olav Fykse Tveit, welcoming Bartholomew, noted that in his 2016 Christmas message, he appealed to all the faithful around the word "to respect the identity and sacredness of childhood". The patriarch called for inter-generational justice and support to children on the move as spiritual responsibility in his message from the Orthodox Church noting a "surrender of culture to technology" in the world. "Christians are called to protect children both in society and within their own communities," said Bartholomew, and that he was "particularly pleased" with the collaboration established between UNICEF and the WCC on the Churches' Commitments to Children. He urged the churches to "undertake initiatives that promote the protection of the environment and subsequently, our children". Bartholomew said, "The ecological crisis is constantly escalating in the name of growth and development." He said, "Humanity remains oblivious to the global appeals for radical change in our attitudes toward creation." Tveit said that Bartholomew is known worldwide as the "Green Patriarch". "Today we recognize you, too, as a pioneer in another urgent field: our churches' responsibility to protect and support children, to defend their rights and care for their well-being," said the WCC general secretary. "Today, together with UNICEF, we make an important step in trying to open up new avenues and possibilities for Churches' Commitments to Children," said Tveit. Both the Ecumenical Patriarch and the WCC general secretary signed a petition for renewed commitments to child rights. Philippe Cori, deputy director for UNICEF's Regional Office for Europe and Central Asia observed that 29 years ago the Convention on the Rights of the Child was submitted recognising specific rights for children. "This is the most ratified UN convention and brings together the best interests of the child and is core to the dignity, along with the right education," said Cori. He said, "Half of the world is children and half of the refugees of the world are children and when they are on the move they are trafficked," many of them fleeing their countries due to violence, climate change, famine and droughts. Jonathan Anugrahan, age 14 from the Church of South India and 18-year-old Laura Groth from the Protestant School in Eisenach, Germany, a member of the Global Pedagogical Network, spoke of their school experiences. Groth asked Anugrahan if the big classes in India of 60 to 100 students contributed to violence at the schools. The celebration, one day after UN Children's Day was part of the WCC's 70-year anniversary with Bartholomew and Tveit saying that "every day is a day for children". Bartholomew noted current challenges facing children include sectors of technology and communication with the computer and the internet dominating every aspect of individual and social life. "Some of the consequences of this change include the so-called 'disappearance of childhood', the loss of the innocence of children and an early induction into adulthood," he said. 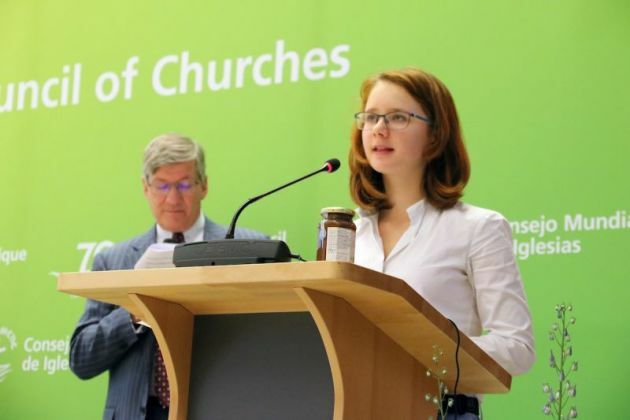 "Children are especially vulnerable to climate change and environmental degradation," said the patriarch, but 14-year-old Swiss student Anouk Walliser Keel spoke of how "people like me and you, ordinary parishioners" can work for climate justice. She said she began her first fund-raising for an environmental campaign with a friend at the age of nine. "Maybe you are wondering why I, a 14-year-old girl am doing a presentation on environmental protection and the church....I believe I can achieve something. This community is the church...The church is the link between the small me and the bigger world." Kiran Oommen, a 21-year-old student, is a member of the United Church of Christ (UCC), USA, which is backing a case he and 21 young people made against the U.S. federal government accusing it of making young people disproportionately affected by climate change. "There is the responsibility to protect our rights to a stable future," said Oommen explaining that, "In the UCC social justice is a core tenet of what it means to be church." Antonia Antonopoulos, head of Civil Society Partnerships at UNICEF, speaking on moving the Churches Commitments to Children's agenda forward said, "We can always count on the commitment of the WCC when we need it. She praised, the "powerful and very real testimonies from children today." Antonopoulos said, "It is important that faith and secular groups share the common values of humanity together."